We all love fries. The French fries is one most beloved foods of all times. Heat oil in skillet over medium heat. Cook and stir potato strips, until brown on all sides, about 15 minutes. 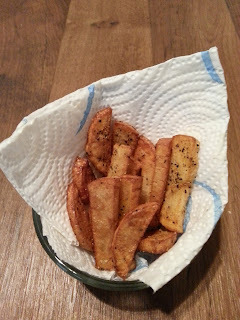 Transfer potato strips to a paper towel lined dish. Sprinkle with season salt and pepper. Love potatoes cooked this way. May I have some ketchup? I have ketchup for you, here you go.